A perfect pairing of fine dining and comfort food – our cheddar steak burger with caramelised onions and portobello mushrooms seats grilled entrecote beneath a garnish of onions marinated in beer and butter. Apace with a bouquet of grilled mushrooms, the flavours are mild, allowing the steak to take centre stage. Melt the butter in a pan over medium heat. Add the sugar and onions and sauté, stirring constantly, for about 15 minutes, or until the onions are soft. Pour beer over the onions a little a time, letting it boil off completely before adding more. Keep going until the onions are caramelised. Season to taste with salt and pepper. Heat a grill pan until it is smoking hot. Grill the steaks for approx. 2 minutes on each side. 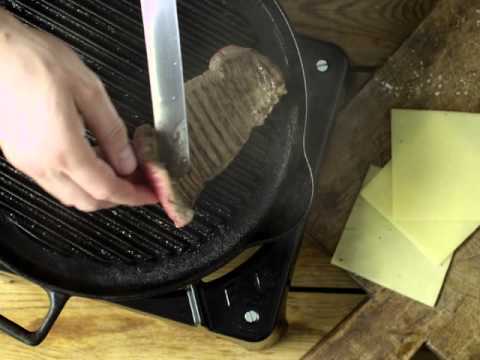 Top each steak with the Castello Tickler Mature Cheese, season with salt and pepper and set aside to rest. Brush the mushrooms with oil and grill them. Split the buns and warm or toast them. Spread the buns with mayonnaise and top with rocket, steak, mushrooms and onions. Serve with chilli-fries and extra mayonnaise.